Teeth whitening is a small change that can make a big difference in your smile. At Tharp & Klaus Dental Clinic we offer The Kor Teeth Whitening System, Opalescence take home teeth whitening, and Lumibrite – our in-office teeth whitening. 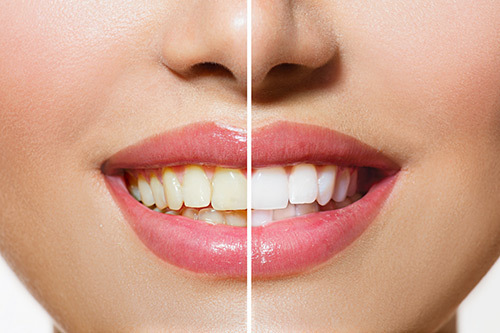 Between these three whitening options, we can whiten teeth with light staining to dark tetracycline stained teeth. Each system is unique and chosen by our dentists to fit your teeth whitening needs and goals. The Kor Teeth Whitening System is one of the strongest teeth whiteners available for stained teeth. 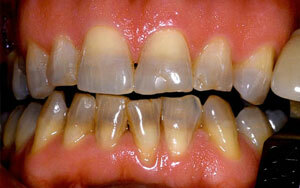 Even the most stubborn of tooth stains dont stand a chance – even tetracycline stained teeth. Say goodbye dark tooth stains, and let The Kor Teeth Whitening System give you a beautiful white smile. If you have mild to moderate staining on your teeth, opalescence is the whitening treatment for you! In just thirty minutes a day, The Oplescence Whitening System can whiten your teeth up to 10 shades! With our comfortable, custom made dental whitening trays, you whiten in the comfort of your own home until you are happy with how white your smile is.